Students working in the community garden alongside David Whitwam of Whitwam Organics. Courtesy of Bible Truth Ministries Academy. Suzette Dean’s tutoring sessions -- which she provided free of charge to children in an economically depressed section of Tampa, Florida -- were known for two things: a warm, nurturing environment, and the strides the children made, despite their struggles in conventional schools. After seeing her impact with the kids, the families urged Dean and her husband Daniel, who is a pastor, to start their own school, the Bible Truth Ministries Academy. 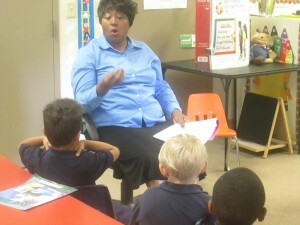 The preK - 12 school opened in 1999 with Suzette Dean serving as principal and Daniel as administrator. The Deans say they’ve taken good ideas wherever they’ve found them, so long as they can help empower children to succeed in life. The result is that the school’s two primary guiding philosophies are the behavior code of the Bible, plus evolutionary science findings about how humans are wired to learn. The two approaches may stem from different foundations, but they have a lot of common ground and build on each other very effectively, says Jerry Lieberman, one of the members of the Evolution Institute think tank who has worked with the Deans over the years. Both approaches emphasize collaboration and community, so it’s no accident that the academy feels more like a home than an institution, Lieberman says. And the students and their parents feel ownership of the school, in part because families requested it and have continued to be involved. Some even helped the Deans to build it, in exchange for tuition credit. But the Deans take the community service ethos even further. Instead of being an island unto itself that caters to only one segment of the population, the academy has expanded into a larger complex that serves the entire community. In addition to the school, the complex includes day care, as well as a church and the H.O.P.E. community center, learning center and community garden, which are open to all. “While we are helping the child [at the school], some of the social issues parents struggle with, they can come to the [community center] and benefit from that,” Daniel Dean says. For example, residents of all ages go there to work on their GEDs, get help with food stamps, use the computers and search for jobs. Public school students also stop by the center after school to work in the community garden, play chess or pursue other hobbies. The school, which employs four teachers and two administrative staffers, is private but caters to a mostly low-income population. It keeps its costs low and its community ties strong by relying on volunteers. All parents are expected to volunteer at the school for at least five hours per year, and many of the older students fulfill their state-mandated community service requirements by helping out with day care, cleaning up, or doing other tasks in the afternoons. The school also uses volunteers, vetted by Suzette Dean, from the wider community. They include students from nearby public schools who choose to carry out their community service at the academy; young adults who are reciprocating with labor in exchange for receiving government benefits while they try to make the transition to independent living; and numerous others -- whether retirees or working men and women — who want to contribute in some way. Similarly, the community center was built with volunteer labor and is staffed almost entirely by volunteers. Courtesy of Bible Truth Ministries Academy. This meshes with the circumstances in which evolutionary scientists say humans learn best -- in an environment where there is respect for personal differences and choices, within a larger context that emphasizes collaboration rather than competition. The academy has mixed-age classrooms, lets students work at their own pace and encourages peer-to-peer learning. At the recommendation of the Evolution Institute, it has also introduced more opportunities for unstructured play into each day because of its beneficial effects on both academic learning and social development, and has added a science laboratory. Mentors and instructors can exert a strong influence on children’s lives, he says, but the nature of the effect hinges on their attitude. “A negative approach breeds resistance, but if the approach is positive, effort will follow.” As a result, children at the academy who are not learning according to state mandates are not held back, because “that is not coming up with a solution for that child,” Daniel Dean notes. “We’re here for the child to do better, not to reinforce the darkness already in them.” Punitive policies tend to precipitate a downward spiral of kids acting out their frustrations, then being pawned off to detention centers that lack inspiring influences or the expectation of a better future. It’s a path that all too typically ends in a very grim place: prison. “They do very well compared to schools in the region with similar populations,” Lieberman notes. More significantly, he has personally witnessed many instances of children who were not performing well elsewhere become “much more cognitively successful, and healthier, both mentally and physically,” after a few years at the academy. Keisha Thomas, whose two daughters attend the academy, says the self-paced system also benefits children who are ostensibly doing well in a conventional school. Her older daughter easily earned A’s in her previous school and was bored in her classes. At the academy, “she’s definitely challenged; they’re not held back,” Thomas says. “The greatest thing is that they can grow in this school.” The downside is that because of the school’s small size, it can’t offer all the sports and other extracurricular activities her daughter enjoyed in her larger school.